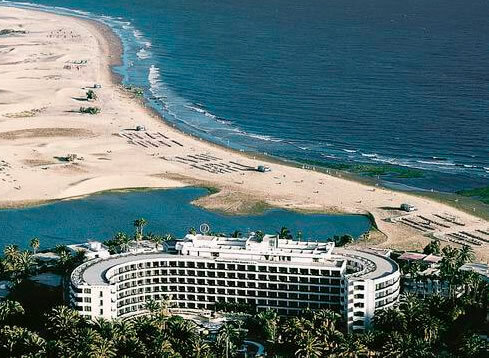 The luxury 5 star Seaside Palm Beach hotel Gran Canaria is located just outside the resort of Maspalomas and 5 kilometres from the resort of Playa del Ingles. 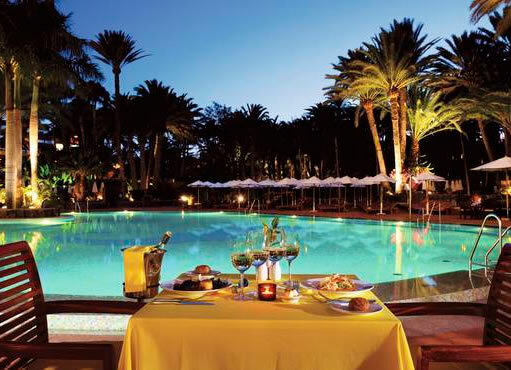 Set in lovely grounds and 1000 year old Palm gardens the hotel is just 70 metres from the beach. This 70's retro designed and renovated hotel is a popular choice with families, couples and golfers. The Palm Beach provides a wealth of facilities for its guests including a wellness Centre. The hotel is 35 Kilometres from the airport. The Seaside Hotel Palm Beach has 328 rooms and suites all rooms are decorated with unique furnishings in contrasting colours and are all fully equipped with a private Bathroom with shower or bath, hairdryer, air conditioning, telephone, satellite TV, internet link, mini-bar, free WiFi, safe, balcony and daily maid service. The hotel has a good choice of bars and restaurants serving mouth watering cuisine, there is the main restaurant the 'Gran Restaurante' and two a la carte restaurants 'La Tratoria' serving Italian food and the 'Orangerie' (open seasonally). During the day the picturesque 'Africano' pool bar is the place for a snack or refreshing drink and in the evenings you can enjoy live shows and entertainment in the salon bar. The hotels facilities have something for everyone there are, 2 swimming pools, a brine bath, health garden, Wellness Centre, Cosmetic salon, water gymnastics, saunas, massages, Gym, table tennis, shuffle board, Boccia, Tai Chi and Yoga, tennis and golf (there are seven courses in the area). The hotel also has conference and meeting room facilities. The Palm Beach Hotel is family friendly and offers a children's pool, activity programme (seasonal), babysitting, animation programme, highchairs and bottle warmers. The Palm Beach Hotel Gran Canaria has a wonderful Wellness centre, this is located in the Palm Garden, the 2000 square metre centre has 11 treatment rooms, thalasso therapy, aromatherapy, Rasul bath and a thalassic swimming pool. There is a Finnish sauna, bio sauna and stone steam bath. The fitness centre has cardiovascular equipment, muscle building and aerobic equipment.